We had not been to Maine in quite some time and we were all missing it. The cold had prevented us from going, so cold, you would not have been able to be outside. Last weekend though, the temps were a bit higher and it was a long weekend for the boys, so this was our window of opportunity to visit the Maine house. The boys were very excited. It was still cold but not cold enough to keep everyone but me from skiing and we did get to spend some time outdoors. I'll revisit our ski day soon, but for now I have an ice adventure to share with you.. The above photo was take at 11:16 in the morning on our last day there. 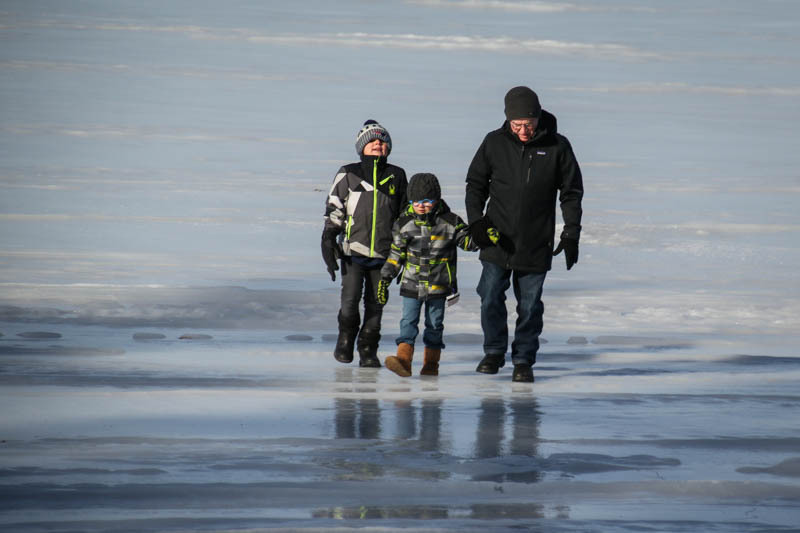 They boys had never walked on the frozen ice before, so they wanted to give it a try. It was a beautiful, sunny day, a breath of fresh air for all of us to enjoy. So off Papa went with the boys to see what walking on the ice felt and sounds like. Just a note...the ice is always growling and crackling as you walk, it's not as quite as you would think. During their short walk, they saw the ice houses that were set up for fishing and a few fresh fish holes that seemed to be abandoned. They were out there not long, before they started to have "face freeze", and so they came back inside. By this time Jenna was all packed up and ready to take the boys home...with lots of hugs, kisses and I love you's, they were on their way....and then things got really interesting. 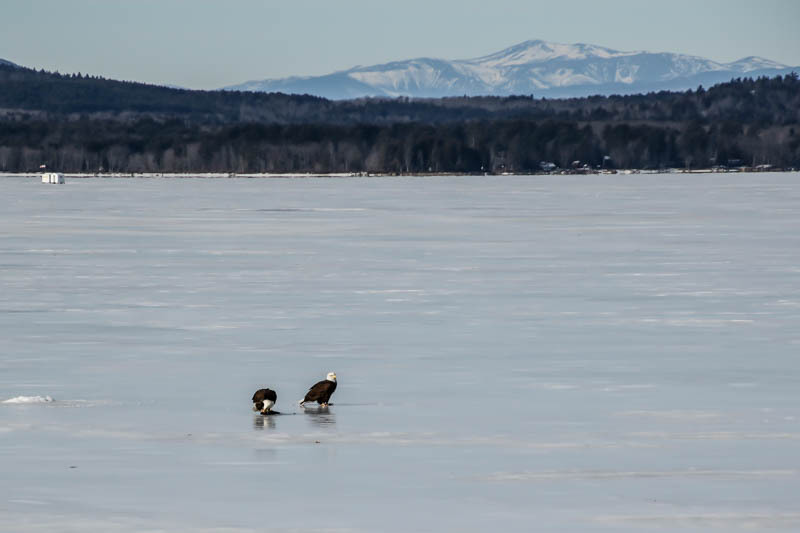 Two bald eagles, with their lunch, standing just about where Jim and the boys had been not many minutes before. I was amazed, thrilled and sad. 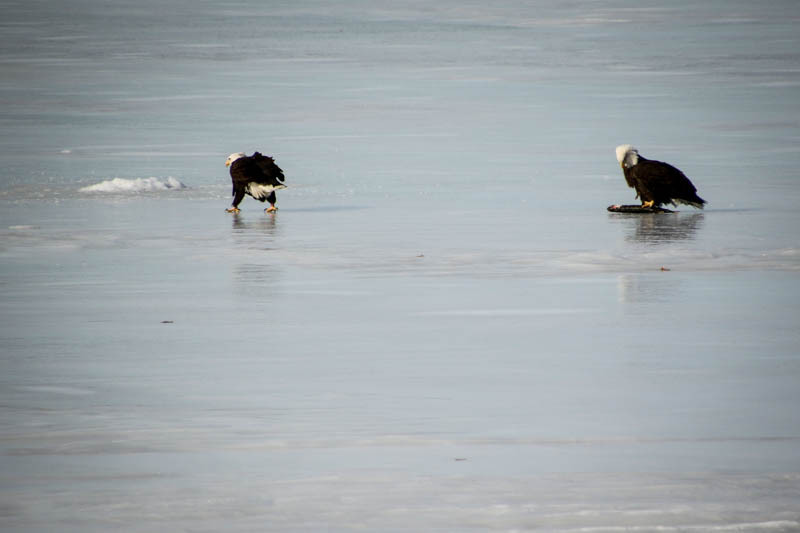 Amazed because in 23 years, even though I know there are eagles on the lake I had never seen one in the winter, never mind two, right outside my door. Thrilled because I happened to have my 300 lens in the house and sad because the boys missed out on this great event. So off I ran, back into the house grabbed my lens and took off down to the beach and started snapping. I was so afraid that they would leave before I could get a couple shots off. That happened to me last week with an owl...no sooner did I get close to the owl than he flew away so I wasn't taking any chances here. Of course, I wasn't being very smart either. No coat or hat...I did manage to get my boots on though, the yard was full of frozen snow, so it was slow going carrying that lens...Still, they were quite far away from me but I kept snapping...finally, I had to leave them and run in before I froze to death. Jim didn't even know I had left the house and if I froze in the yard it would have taken him hours, maybe days to find me...because he doesn't usually check to see where I am. True story. I'm going to apologize straight out because some of these photo's are not tack sharp. I don't care because just the fact that I could spend time watching these magnificent creatures, birds of prey, was a gift. I wasn't going to look a gift horse in the mouth because I didn't have time to set up a tri-pod. I also wasn't going to miss a minute with them. So going forward I will share a few photo's with you and explain, as best I can, the process and some of their behavior. This is not the first time that I have had the pleasure of being with these birds so I know sometimes what is happening. These two are male and female...a family. I don't know where they got the fish but I'm assuming it was down at the open water near the bridge. Jim said the fishing holes out where him and the boys were, had not been drilled all the way through. So they got their fish and brought it here. I'm assuming that is the male sitting on his fish and that he feeds first...he is probably also in the process of making sure the fish is dead. When the male gets done feeding, usually the female will get her turn. It doesn't work like that in my house...but the male will stay close by even as he is flying away...I can still see him in the sky. She slides in and then checks things out and soon she will feed. 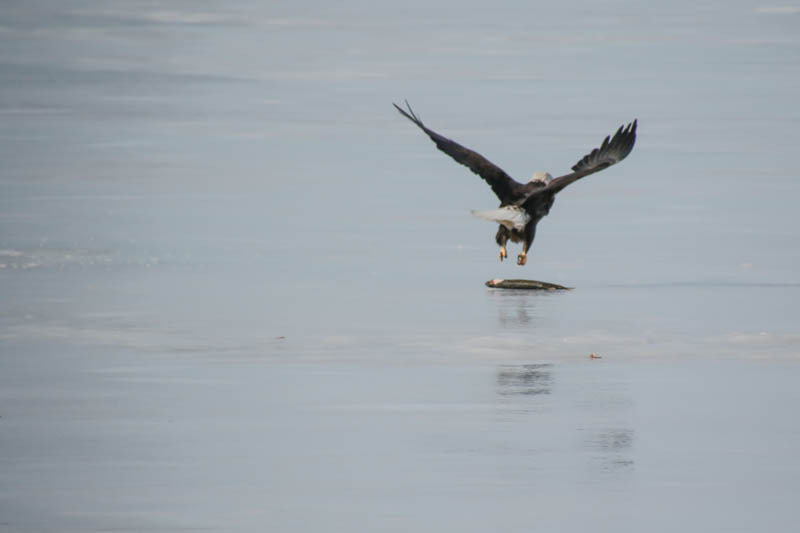 The white part that you see at the fishes head there is the meat that the male eagle has been tearing at. Honestly, both Jim and I were shocked at the size of that fish...I probably won't ever swim in the lake again just knowing they are down there. Also by now, I have probably taken about 50 photo's so I'm just giving you a brief over look here. So yes, the male ate again. She does get her turn eventually. 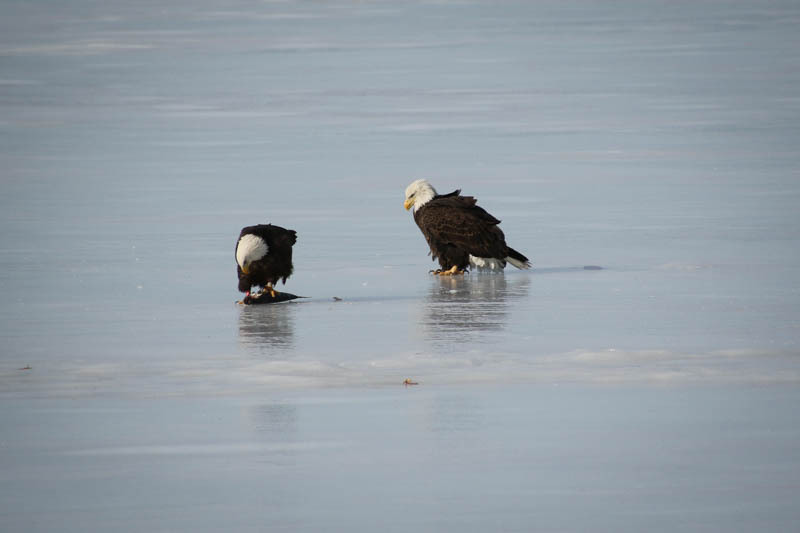 So here is what I noticed both times that I have seen eagles eat or kill, while one is eating, the other is always keeping watch. If another bird tries to come close to the food...there is a food fight. The eagles always win. It is only when they are done feeding and they both fly away that another bird dares to enter the scene. By that time the fish is pretty much gone. This day, it was a long process because there were still surprises waiting for me. I'm sorry I couldn't have cropped these more because most of them are in focus...but I just didn't want to blow them out or not be able to use them for printing should I decide to. She waited for a very long time for her turn and she was tired of being the look-out. She did chase away a few crows but other than that it was pretty quiet, except for the click of my camera. I was quite a distance away though. I feel so bad for her here. She must be drooling for a piece of that fresh fish. Stingy man. He's got her tail feathers all ruffed up. Well they finally switched places ad now it's her turn. Let's see how he likes keeping the look-out. Now she is stepping on the poor fish...Nature is so brutal sometimes. It's hard to watch. So this is the view I will leave you with. Mt. Washington was snow covered and brilliantly visible this weekend. In the summer you can hardly see it for days because of the different, humid air. In the winter it is crisp and clear when it isn't snowing or raining...See the little fishing house out there to the left. The views in winter are so much more majestic and peaceful. Quiet is what you hear in winter. 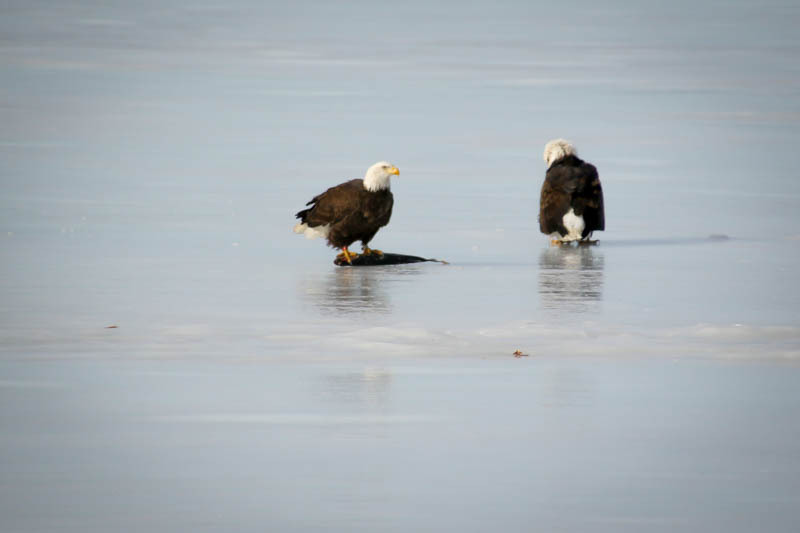 Oh, I was surprised that these eagles squawk at each other. That was pretty cool to hear. I loved my time with them...and I don't take it for granted. I know it was a gift granted to me...fortunately, I had my equipment with me so I was almost ready. Even without a camera, this would have been a beautiful experience. Nature in the raw. It doesn't get any better than that. A gift money can't buy. I'm grateful for the experience. This is round one. After so much watching and clicking, my hands were freezing so I went back inside to warm up, thinking I got the best of them...even though most of these are not close enough. I was a happy girl. I was in for a surprise though when I got inside and realized that I still had the 500mm in the car from my trip to Plum Island the day before looking for the Snowy Owls. New excitement set in as Jim ran to get me the other lens...Oh my, now I was really going to get them...but there was a lesson for me there and a turn of events also...come back next time and you will have the full story. A lesson for me and hopefully some info for you so you won't make my major mistake if you ever get this lucky. I can't wait to share the rest of the story with you...life is good at the lake as well as at the ocean...I'm a water baby for sure. All Eagle photo's were shot with the Canon 7D MK11. Tamron lens 16-300. " "You must live in the present, launch yourself on every wave, find your eternity in each moment. Fools stand on their island opportunities and look toward another land. There is no other land; there is no other life but this." Henry David Thoreau.